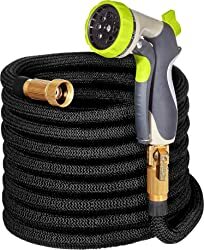 When you are caring for your flowers and plants in your yard, you want to have a hose that is lightweight and easy to maneuver while you are using it. Any garden hose you use should not develop kinks or twists during operation. There are many no-kink garden hoses available to buy. We have reviewed our favorites and are sharing the results. 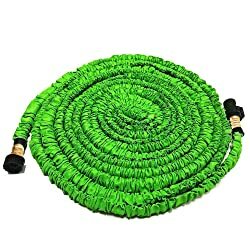 What is the best kink free garden hose available for you to buy? Although there are many products available, this does not have to be a difficult question to answer. Take a look at the products below and you should find a no-kink garden hose that will meet your watering needs. This lead-in ⅝-inch garden hose is extremely flexible and will bend in all temperatures. Flexzilla rates the temperatures for this hose from -40 to 150 degrees Fahrenheit! The outer cover is abrasion-resistant and both ends of the lead-in hose have crush-resistant anodized aircraft aluminum fittings. The hybrid polymer material on this hose allows it to coil easily and then lay flat seconds later. It does not retain shape memory and will not kink under pressure. The connections use O-rings to ensure long-term leak-free conditions. This garden hose is lead free which makes it safe for drinking water. Hospaip designed this hose using a double latex pipe covered in 3750D polyester fabric. The hose is extremely flexible and durable making it a great choice for maneuvering around your garden. It will never kink, curl or twist while you are using it. The hose starts out at 17-feet long and expands up to 50-feet once water flows through it. Hospaip includes an 8-pattern nozzle spray made of zinc alloy material. It has an easy knob to control the water pressure and a rotating bezel to select a specific spray pattern. This hose and nozzle spray give you flexibility to water your delicate flowers with a light mist spray or wash your car with a heavy direct spray. You can store the hose in the free storage bag when you are not using it. The hose will contract to a size that is more manageable once water has drained from it. It will be compact enough for you to store away in your garage or shed. 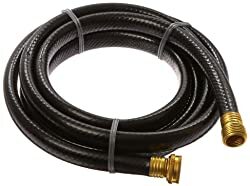 This connector hose is a 3-ply hose made of reinforced remnant materials. It includes lead-free brass connection fittings and measures 15-feet long. 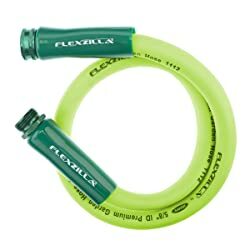 This connector hose allows you to add an extension onto your primary garden hose. 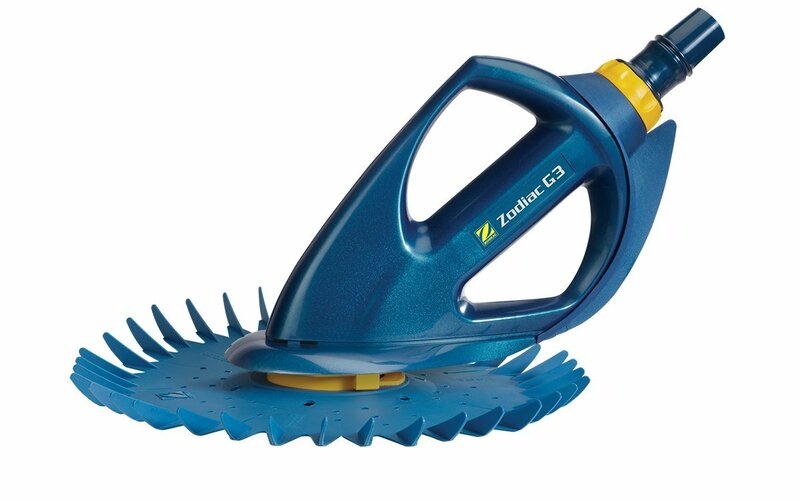 It works great in other applications such as a dehumidifier hose drain or a leader hose for your hose reel. Teknor guarantees that this water hose will never kink or tangle. It uses a patented Reflex Mesh technology which consists of mesh reinforcements throughout the hose preventing kinks and twists from starting. This Neverkink product contains a MicroShield antimicrobial protection. This protects the hose against mold and mildew. The industrial grade connection fittings are made of high strength aluminum and are guaranteed to not rust or corrode. The fittings are crush-proof up to 1400 pounds. A heavy gauge flexible coil design prevents any kinking at the faucet. This hose remains flexible down to 45 degrees Fahrenheit. It is a 50-feet long and ¾-inch in diameter hose. This is a commercial grade product that will work great in residential settings. This Suncast product is considered a leader hose replacement. It will fit all hose reels and is used to attach the reel to your water faucet. 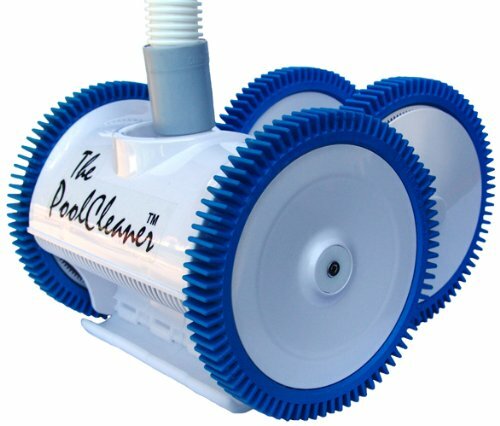 The 10-foot length allows you to move your hose reel away from the water faucet. This gives you more options for your hose reel placement. Suncast designed this hose as a 4-ply rubber product to make it durable for your specific needs. It is lightweight at only 1.7-pounds and works well as a short hose for your watering needs. 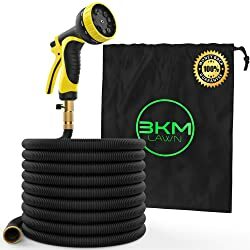 This 3KM garden hose starts out at 33-feet. 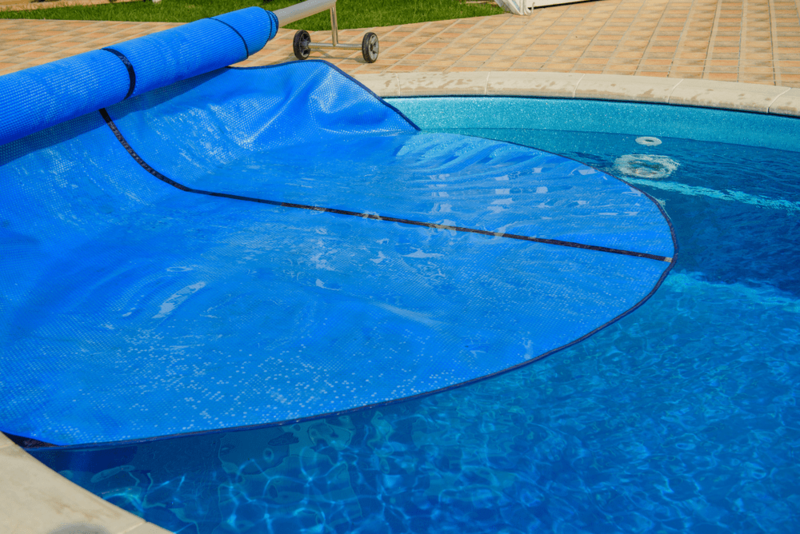 Once water pressure starts to go through the hose, it will expand to a full 100-feet. 3KM designed this hose with a triple layer latex core to make it durable and kink-free. This product includes a 9-pattern spray nozzle which gives you flexibility to water your plants with a soft water stream. The spray nozzle patterns offer many options for a light soft water spray or a powerful direct stream spray for washing a car. This product includes a hose storage bag. When you finish using your 3KM hose, you can drain the water from the hose and coil the compact 33-foot length hose and spray nozzle into the bag for out-of-sight storage. 3KM offers a full money-back guarantee on this product. This is a great risk-free and kink-free garden hose option for your gardening needs. This Wingogh garden hose start out at 16-feet. Once you turn on the water faucet, this hose will take only a few seconds to expand to 50-feet! 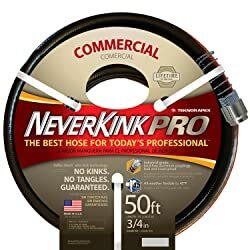 This hose will never kink, twist or curl. It’s flexible design makes sure you can easily maneuver through your yard to water your plants and flowers. You can control the water in the hose by using the on/off valve at the end of the hose. The durable latex core and high quality fittings make this one of the better garden hoses available on the market. I like this hose because it can operate in temperatures from -4 to 98 degrees Celsius. This hose is lightweight, flexible and suitable for most spray nozzle attachments. This hose will last 50% longer than other hoses. 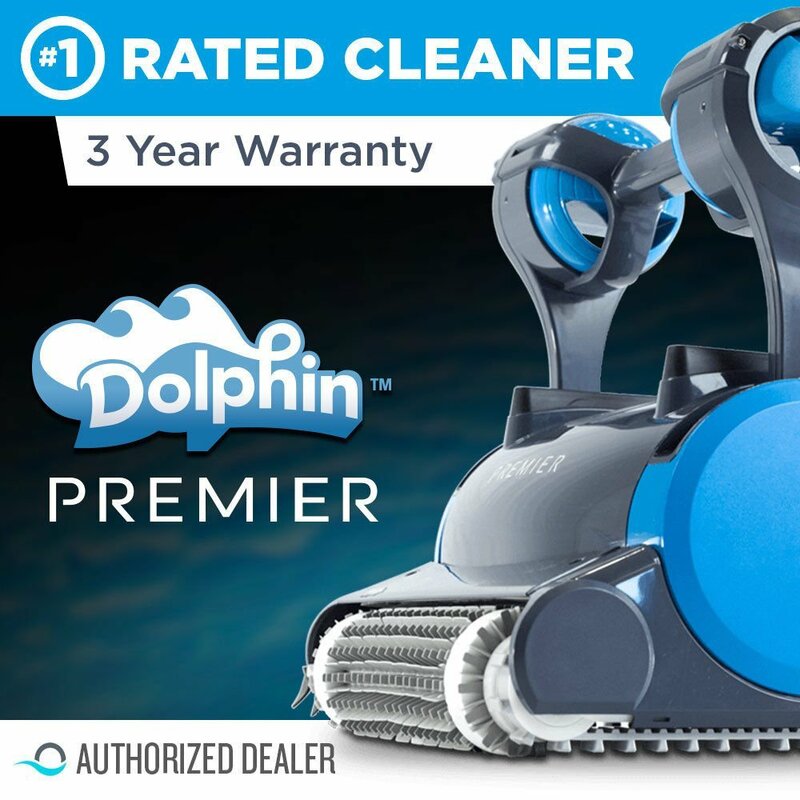 Wingogh provides an 18-month warranty on this product making it a risk-free choice. 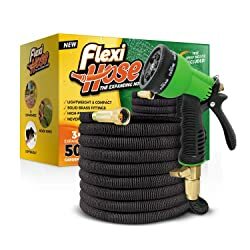 The FlexiHose 50-foot garden hose is a lightweight no-kink flexible water hose. 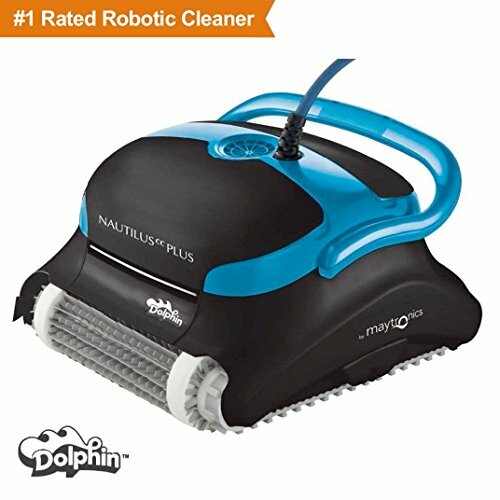 It has strong brass connectors and double latex piping, making it a strong, leak-free hose choice. The end of the hose has an on/off valve so you can quickly control the flow of water through the hose. This hose starts out at a 17-foot length before it has water running through it. 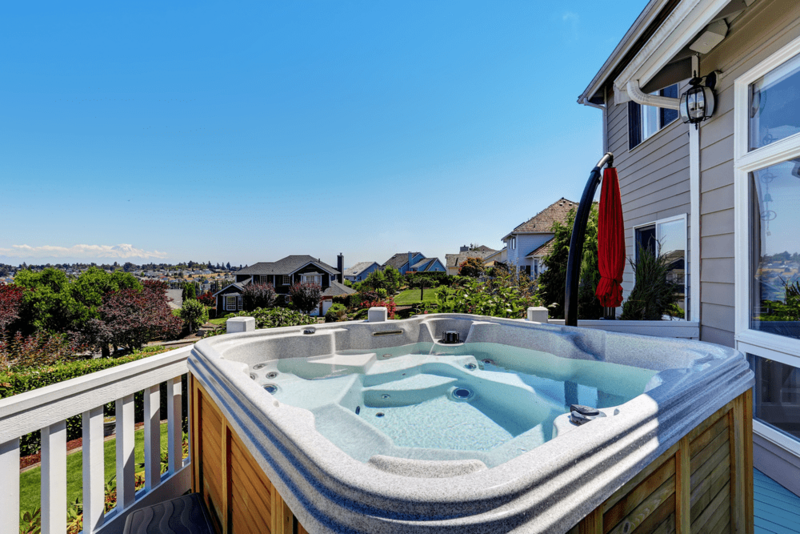 Once you turn on the water, the hose will automatically expand to its full 50-foot length. If you leave your hose sitting in the sun during the summer, you are in luck because this hose can operate up to 113-degrees Fahrenheit. The 8-pattern spray nozzle gives you all the flexibility you need to water your delicate flowers or wash your car. Worth Garden designed the 25-foot water hose for long-term performance. The hose is ¾-inch in diameter and features top quality brass fittings and strong rubber seals. Worth Garden uses their own Apex anti-kink technology to make sure this garden hose does not kink while you are using it. Weather proof fittings make sure that this hose can operate in conditions ranging from -20 to 60 degrees Celsius. This hose is reinforced with solid brass fittings and high-grade industrial-strength rubber. 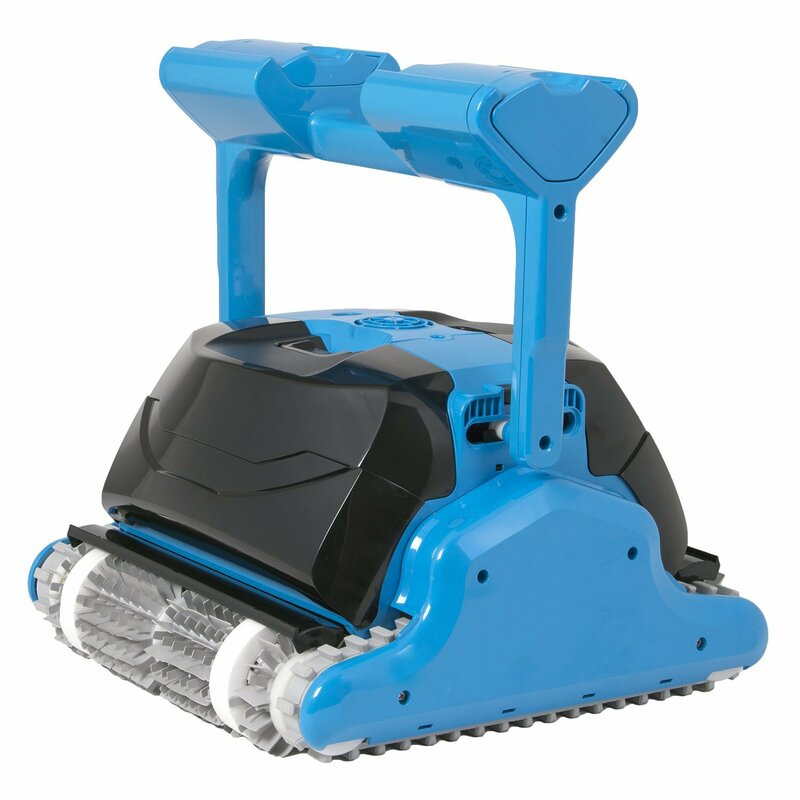 This maintains a tight seal on your hose and gives you anti-skid protection. 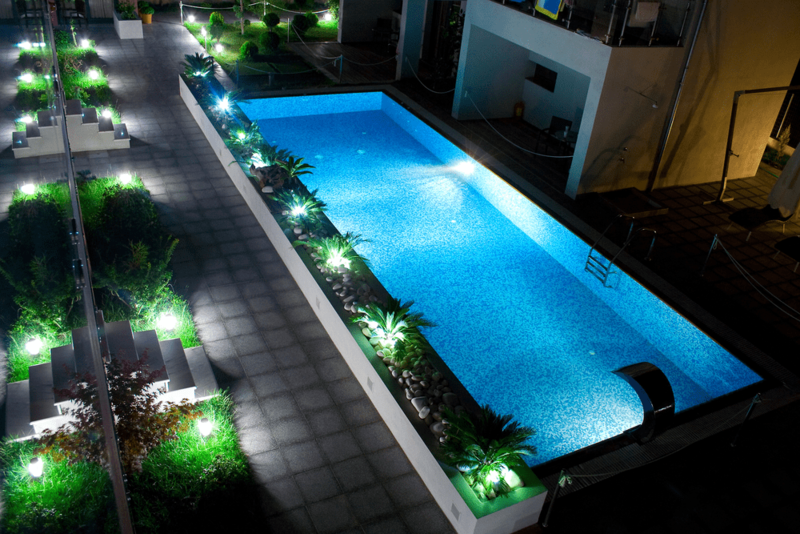 Worth Garden offers a 100% risk-free purchase and a 12-year warranty that cannot be beat! 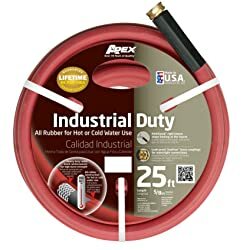 The Apex all rubber red-colored hose is a commercial grade hose made for both hot and cold water uses. It is 25-feet long and has a rigid sleeve to prevent kinking at the faucet. Apex designed this hose to withstand high temperatures up to 180-degrees Fahrenheit. It has leak proof and crush-proof couplings. The reinforced rubber construction sets the stage for long-term durability. Not all hoses can operator under high heat temperatures. 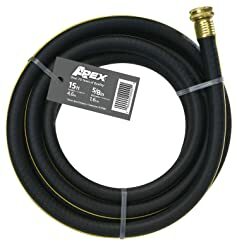 If you need a hose that can work in both cold and hot conditions, then consider this Apex all rubber hose. Apex hoses are all made in the USA. The products above have given you insight into the pros and cons of some no-kink hoses. There are many features you should consider before you buy a kink-free garden hose. We have shared some of these features for you to consider. Are you looking for a hose you can use to water all of your plants and flowers in your yard? If so, you want to be sure the garden hose you choose will reach all corners of your yard. It is best to take measurements from your water faucet to the farthest corner of your yard. You can use that measurement to find a garden hose length slightly longer than that measurement. 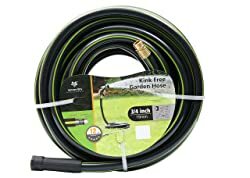 If you need a hose you can use as a leader hose from the water faucet to your hose reel, then buy a short length leader hose that is kink-free. 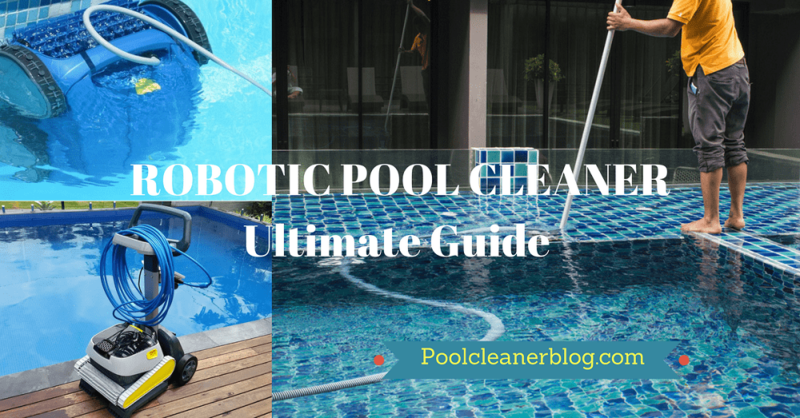 This will prevent any kink or twist issues, especially if your hose reel swivels. The material composition of most kink-free hoses is a double or triple layer latex core and a polyester fabric cover. This hose composition makes the hose lightweight and easy to carry around your yard. Some hoses are made of all rubber. These are the best types of hoses to buy if you need a kink-free hose. Rubber hoses are typically so rigid that they will no-kink or bend. There are some hoses that will operate in a wide range of temperatures. You can also find hoses that are made specifically for hot/cold water applications. It is important to decide if you will leave your hose outdoors in the weather elements all the time. If you do, then get a hose that can withstand the temperature swings for your area. If you want to make sure your hose lasts for a long time, then consider a no-kink garden hose. Kinks in a hose will often lead to leaks in that same location. You have seen our top 10 picks in kink-free garden hoses and we have provided guidelines on features to consider. You should have all the information needed to make an informed kink-free garden hose choice.